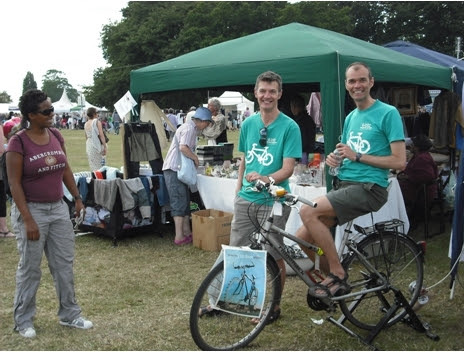 Join us for the next Lambeth Cyclists Architecture Ride on Saturday 22 September 2012. This ride is a revival of a ride we did six years ago looking at the work of the man who transformed London in the wake of the Great Fire.- Christopher Wren. Already celebrated as a mathematician, astronomer and inventor, Wren seized his chance to make perhaps the greatest mark any one architect has made on a city, with fifty-one churches and their infinitely-varied steeples dancing around the great drum of St Paul’s and its dome. Open House Weekend gives us the chance to go inside his City churches, many of which are rarely open, especially at weekends. We’ll visit as many of the churches as we can fit in, and finish with a look at one of his grandest “domestic” projects, the Royal Hospital Chelsea. Meet 10:30am for 10:45 start at The Monument, Fish Street Hill, at the north end of London Bridge, EC3 (click on address for map). We’ll finish in Chelsea about 4.00. 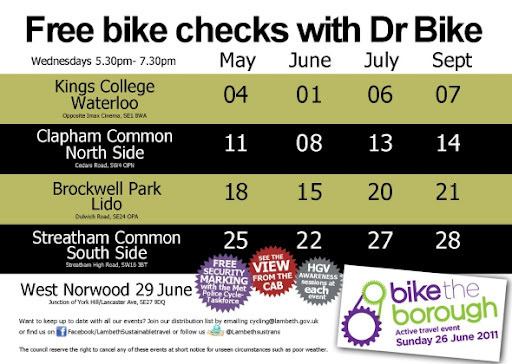 These Dr Bike sessions takes place every Tuesday evening in September- see list of dates below. Join us for the September Lambeth Cyclists meeting this evening upstairs at the Priory Arms, Lansdowne Way, Stockwell, SW8 2PB. Lots of news (much positive), and details on a forthcoming speaker or two. Starting to look at 2013 and our campaigning and other plans for the year. Please come along if you can. 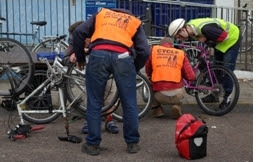 Following on from the overwhelming demand for our maintenance classes due to start tomorrow Lambeth Cyclists will be running another set of cycle maintenance classes in October. Come on our cycle maintenance classes, a new set of which will start on Tuesday 22 October 2012.